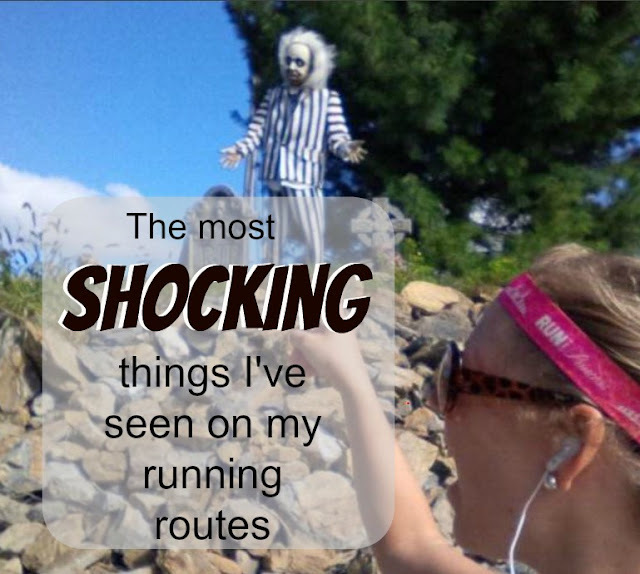 Here are the top five things I thought were pretty shocking/interesting along my routes. 1. My deer encounter where I literally thought I was going to be attacked. I was not expecting this animal to be blocking me on the path and not letting me pass. 2. The Murder Scene. It was definitely a shock to be stopped by crime tape and cadavor dogs. 3. I also was not expecting to see two people being so intimate on my wooded trail that I've run hundreds of times before. 4. 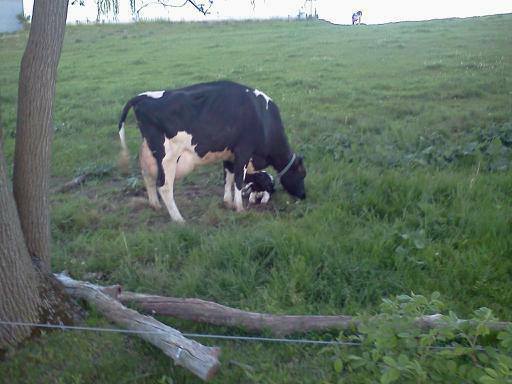 I've seen a calf being born on a farm along side the rail trail. 5. And just for fun, I was shocked to see Beetle Juice (shown above) on my trail when he started popping up 2 years ago. I wonder if he will make an appearance this year? One time, I encountered a small group of deer (4-5?) crossing a county road just seconds before we (myself and two friends) approached them. I love approaching deer but get worried when they start to approach me! OMG, the murder scene would shock me the most! You and I sure seem to have a lot of interesting sights on the run! It certainly keeps things fun! That's a lot of crazy things! The deer around here are like that. They don't move! the deer would have freaked me out! It definitely was a shock! The calf sighting was probably one of the first interesting things I saw on the trail many years ago! The murder scene would definitely have been the scariest thing to come across. Eek! I wasn't exactly scared but was certainly shocked when I found out what it was! OMG! I can't believe you saw a calf being born! So crazy/cool. We were fascinated by it for sure. We waited and watched until he/she got up and walked. He is pretty real like isn't he? That beetlejuice is definitely a pretty frightening thing to see! The people who own him actually took him down for a while. I wonder if someone complained? Wonder if he'll be back up this fall? Just don't say his name 3 times! You DO see the best stuff on your runs and you tell a good story. I do secretly hope I come across a crime scene on a run sometime. Aren't runners the people who always find the dead bodies? 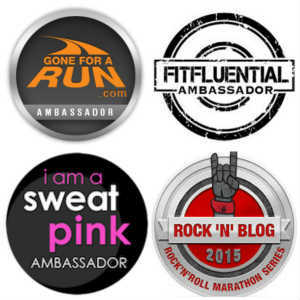 Runners and hunters! You SHOULD be the one to come across a crime scene! Haha maybe I should concentrate more on running and less on looking at other things happening! LMAO! Love this post. I wish I would see more entertaining things on my runs...would keep things interesting, at least! The most excitement I've had is (unfortunately) being chased by dogs. Wow. Just wow. I think the murder scene would absolutely be off-putting. I think where I run is actually pretty tame compared to a lot of what you guys see on the run! 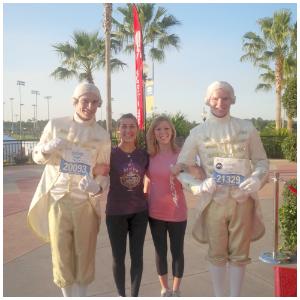 You have some interesting things on your runs... I'm not sure which is the most shocking! The murder scene is the most shocking to me...yikes! But those are all pretty crazy. Girl, you HAVE seen some shocking things!!! I guess my most heart-racing shock would be the ginormous freaking man-eating snake lying in our path. Yeppers, that was wild! You do always have the best stories from your runs! I would definitely be freaked out by the murder scene. I've come across a ton of things on the lakefront in Chicago - never a murder. We witnessed an insane car accident on an icy day but luckily the people were ok!